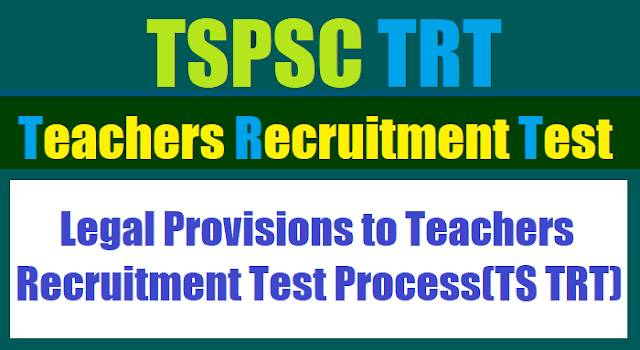 TSPSC TRT Legal Provisions Governing the Teachers Recruitment Test Process: TSPSC TRT Legal Provisions for TS TRT Teachers Recruitment Test Process, TS TRT Legal Provisions for TSPSC TRT Teachers Recruitment Test Process, TSPSC Teachers Recruitment Test Legal Provisions to TS TRT Recruitment Process. Recruitment process for 8,792 school teacher posts to begin from October 30. TS TRT notification for filling up of 8,792 vacant posts in government-run schools was issued by the Telangana State Public Service Commission. The TSPSC for the first time will conduct the teacher recruitment test (TRT) for 31 districts for school assistant, language pandit, PET, SA P.Ed and secondary grade teacher posts in government schools, Zilla Praja Parishad schools and Mandal Praja Parishad schools. The TSPSC will accept applications for the TRT from October 30 to November 30. "It should be noted by the candidates who apply for school assistants, language pandits and secondary grade teachers that 80% weightage will be given for written test and 20% weightage for teachers eligibility test," reads the notification. Officials said that the dates for the exam will be declared in the second week of February, 2018. As per the notification, highest number of vacancies are available in Telugu medium to the tune of 6,303 followed by English (964), Urdu (900), Hindi (516), Kannada (31), Marathi (53), Tamil (five) and Bengali (11) respectively. Figures shared by the TSPSC reveals that the highest number of vacancies are available in the Sangareddy district (to the tune of 903) followed by Kumarambheem Asifabad (894) and Vikarabad (820). The number of vacancies in Hyderabad stands at 417 and Ranga Reddy 521. Vacancies available in Warangal are 55 followed by Khammam (57), Peddapalli (53), Jangaon (60), Karimnagar (71) and Rajanna Siricalla (76) respectively. According to the notification, there are 5,415 vacancies for secondary grade teachers, 1,941 for school assistants, 1,011 for language pandits, 416 for physical education teachers and nine for school assistants (physical education) respectively. 1. Vacancies: The recruitment will be made to the vacancies notified before the examination only. There shall be no waiting list as per G.O. M No. 81 General Administration (Ser.A) Department, Dated 22/02/1997. If additional vacancies are reported by the Government an addendum to that effect will be issued. The vacancies/vacancy position is subject to variation Medium wise/Subject wise/Roster point wise. 2. Recruitment: The recruitment will be processed as per the Notification and also as per the G.O.Ms.No.11, School Education (Ser-II) Dept., Dt.23/01/2009, G.O.Ms.No.12, School Education (Ser-II) Dept., Dt.23/01/2009 read with G.O.Ms.No.25, School Education (General) Dept., Dt.10/10/2017 and orders / Instructions issued by the Government and also as decided by the Commission from time to time. 3. Constitutional Provisions: The Commission is empowered under the provisions of Article 315 and 320 of the Constitution of India read with relevant laws, rules, regulations and executive instructions and all other enabling legal provisions in this regard to conduct examination for appointment to the posts notified herein, duly following the principle of order of merit as per Rule 3 (ix) (a) of the TSPSC Rules of Procedure read with reference to relevant statutory provisions and ensuring that the whole recruitment and selection process is carried out with utmost regard to maintain secrecy and confidentiality so as to ensure that the principle of merit is followed. A candidate shall be disqualified for appointment, if he himself / she herself or through relations or friends or any others has canvassed or endeavored to enlist for his candidature, extraneous support, whether from official or non-official sources for appointment to this service. 4. District/Local: The District and Local Reservations shall be followed as per the Para - 8 of A.P. Public Employment (Organization of Local Cadres and Regulation of Direct Recruitment) Order, 1975 (G.O.P. No. 674, G.A. (SPF-A) Dept., Dated: 20/10/1975) read with G.O. Ms. No. 124, General Administration (SPF-A) Department, dated: 07/03/2002 and other orders issued by the Government and within the meaning of Sections 3 and 97 of A.P. State Reorganization Act 06/2014. 5. Employed: The persons already in Government Service/ Autonomous bodies/ Government aided institutions etc., whether in permanent or temporary capacity or as work charged employees are required to inform in writing to the Head of Office / Department, as the case may be and required to submit the “No objection” from the concerned Head of Office / Department to the Commission as and when required to do so. 6. Penal Action: The Commission is also empowered to invoke the penal provisions of the A.P. Public Examinations (Prevention of Malpractices and Unfair means) Act 25/97 for matters connected therewith or incidental thereto and as per the Rules of Procedure of TSPSC published in Telangana Gazette No: 60 dated 28/12/2015 in respect of this Notification. 7. Caste & Community: Community Certificate issued by the competent authority (obtained from Government of Telangana State) in terms of G.O.Ms No. 58, SW (J) Dept., dt: 12/5/97 read with G.O. Ms. No. 5 Scheduled Castes Development (POA.A2) Dept., Dt. 08/08/2014, G.O. Ms. No. 11 Scheduled Castes Development (POA.A2) Dept., Dt. 17/09/2014 and G.O. Ms. No. 2 Scheduled Castes Development (POA.A2) Dept., Dt. 22/01/2015 should be submitted at appropriate time in respect of SC & ST Candidates. In respect of candidates belonging to Backward Classes are required to produce Community Certificate (BC-A, BC-B, BC-C, BC-D& BC-E) from Competent Authority i.e., from Tahsildars in the State of Telangana not below the rank of Deputy Tahsildar through E-seva/ Mee-seva (G.O. Ms. No. 16 BCW(OP) Dept., Dt. 11/03/2015) and orders and instructions issued by the Government from time to time. As per General Rules for State and Subordinate Service Rules, Rule -2(28) Explanation: No person who professes a religion different from Hinduism shall be deemed a member of Schedule Caste. BC’s, SC’s and ST’s belonging to other states are not entitled for any kind of reservation. 8. Reservation: (i)The Reservation and eligibility in terms of General Rule 22 & 22 (A) of State and Subordinate Service Rules are applicable. ii) The Reservation to Women will apply as per Telangana State and Subordinate Service Rules. iii) Reservation to Disabled persons is subject to their eligibility to any of the above category of posts and shall be subject to Telangana State and Subordinate Service Rules governing the posts. The required extent of deformity and the genuineness of the Medical Certificate and in the case of ambiguity or doubt, the same shall be referred to the Appellate Medical Boards as per the instructions of the Government. (iv) Reservation to Ex-Serviceman is applicable as per State and Subordinate Service Rules. (v) Reservation to BC-E group will be subject to the adjudication of the litigation before the Honorable Courts including final orders in Civil Appeal No: (a) 2628-2637 of 2010 in SLP. No. 7388-97 of 2010, dated. 25/03/2010 and orders from the Government..
9. LOCAL SCHEDULED AREA CANDIDATES: As per G.O.Ms.No.3 Social Welfare(TW.EDN.II) Dept. Dt.10.01.2000 the appointment of posts of teachers in schools situated in the Scheduled Areas in the State subject to the modification that all the posts of teachers in the schools situated in Scheduled Areas in the State of Telangana shall be filled in by the local S.T candidates only out of whom 33 1/3 % shall be women (wherever applicable). Explanation:- “The Local Scheduled Tribe Candidate” means, the candidate belonging to the Scheduled Tribes notified as such under article 342 of the Constitution of India and the candidates themselves or their parents have been continuously residing in the scheduled areas of the Districts of Telangana State in which they are residents till to date since the 26th January, 1950. Note:They will also be considered for selection to the posts notified in Plain Area, if they come up for selection. 10. Distance Education: The Candidates who have obtained Degrees through Open Universities / Distance Education mode are required to have recognition by the University Grants Commission / AICTE / Distance Education Council as the case may be. Unless such Degrees had been recognised by the relevant Statutory Authority, they will not be accepted for purpose of Educational Qualification. The onus of Proof of recognition by the relevant Statutory Authority that their Degrees / Universities have been recognised rests with the Candidate. PARA-VI: RESERVATION TO LOCAL CANDIDATES: Reservation to the Local candidates is applicable as provided in the Rules and as amended from time to time as in force on the date of notification. The candidates claiming reservation as Local candidates should obtain the required Study certificates (from IV Class to X Class or SSC) (OR) Residence Certificate in the Proforma only for those candidates who have not studied in any Educational Institutions as the case may be. The relevant certificates may be got ready with authorized signature and kept with the candidates to produce as and when required. DEFINITION OF LOCAL CANDIDATE: In terms of Para-(7) of A.P. Public Employment (Organization of Local Cadres and Regulation of Direct Recruitment) Order, 1975 (G.O.P. No. 674, G.A. (SPF-A) Dept., Dated: 20/10/1975). "LOCAL CANDIDATE" means a candidate for direct recruitment to any post in relation to that Local area where he/she has studied in Educational Institution(s) for not less than four consecutive academic years prior to and including the year in which he/she appeared for S.S.C or its equivalent examination. If however, he/she has not studied in any educational institution and obtained SSC or its equivalent qualification or Open School, Private Study basis, he/she has to produce residential certificate issued by the Tahsildar. i) In case any Candidate who does not fall within the scope of above then, if he/she has studied for a period of not less than seven years prior to and inclusive of the year in which he/she has studied SSC or its equivalent qualification, he/she will be regarded as local candidate on the basis of the maximum period out of the said period of seven years and where the period of his/her study in two or more local areas or equal such local area where he/she has studied last in such equal periods will be taken for determining the local candidature. Similarly, if he/she has not studied during the above said period in any Educational Institution(s) and obtained private study the place of residence during the above period will be taken into consideration and local candidature will be determined with reference to the maximum period of residence or in the case of equal period where he/she has resided last in such equal periods. ii) If the claim for local candidature is based on study, the candidate is required to produce a certificate from the Educational Institution(s) where he/she has studied during the said 4/7-year period. If, however, it is based on residence, a certificate should be obtained from an officer of the Revenue Department not below the rank of Tahsildar or Deputy Tahsildar in independent charge of Mandal. iii) If, however, a candidate has resided in more than one Mandal during the relevant four/seven years period but within the same District or Zone as the case may be separate certificates from the Tahsildar exercising jurisdiction have to be obtained in respect of different areas. NOTE: (A) Residence Certificate will not be accepted, if a candidate has studied in any educational institution upto S.S.C. or equivalent examination, such candidates have to produce study certificates invariably. The candidates, who acquired Degree from Open Universities without studying SSC / Matriculation or equivalent in Educational Institutions, have to submit Residence Certificate only. Educational institutions means a recognized institution by the Government / University / Competent Authority. The Open school students must invariably enter the residence particulars in the Application form, failing which they will automatically fall under “OTHERS” (NON-LOCAL) category..